As a ‘snacker’ I’m always trying to find healthy alternatives to the stuff that is full of ingredients that you shouldn’t eat. It’s not always easy. But I’ve discovered my go-to snack, which has been a revelation. There really isn’t anything else like it on the market that I’ve come across that fits the bill. My son can take Element to school and there is no mess, no fuss, and I know he’s eating well. I can have pre- and post-workout snacks that give me energy and contain goodness. It’s a win-win situation. So, what are they? 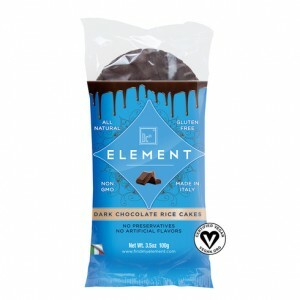 Element is gluten free, GMO free rice cakes with no preservatives, no artificial flavors, are cholesterol free, have no corn syrup, no trans fats, contain RGBH free milk, have BPA free packaging and which are made in Italy. And they have only 80 calories per serving and only 5 grams of sugar. They are also only 2 Weight Watchers points. 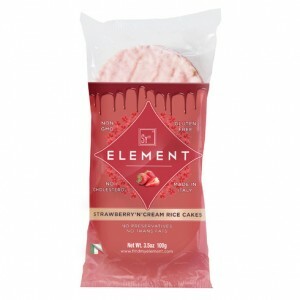 Element believes in ‘real food’, which is what these delicious rice cakes are. Coming in flavors of dark chocolate, milk chocolate, sweet vanilla orange, and strawberry ‘n’ cream the snacks are the perfect size for all snackers out there. They aren’t junk food, which means that you feel good when you eat them and they are of nutritional value in your diet. Plus, Element supports small scale farms, so they are ecologically friendly. My son was so excited when I told him that he had the different flavors in his snack box for school. His favorite was the Strawberry ‘n’ Cream. You know it makes sense to give them healthy snacks that they enjoy when they request something! My favorite are the Dark Chocolate rice cakes, which contain the following ingredients: 60% dark chocolate (sugar, cocoa mass, cocoa butter, emulsifier, soy lecithin, natural vanilla flavor-minimum 52.5% cocoa), 40% rice cakes (non-GMO wholegrain brown rice, non-GMO rice). How good does that sound? And they taste sensational! We took ours back to the UK for a visit, and all my son’s cousin’s wanted some! I am banning all junk food now for my son, telling him he eats only fresh, nutritious food, and Element will be in that list of good foods, much to his and my delight. I guess that’s why you need to try Element rice cake. I don’t like Quaker rice cake either but this one is good.